Why do so many Corbyn critics insist on outright lying about what Labour's Brexit position actually is? I've got no problem with people expressing opposition to Labour's six tests Brexit policy if they're still strongly in favour of remaining in the EU. The right to criticise and dissent are absolutely vital in any kind of democracy. What I object to is the number of Remainers and Corbyn critics who insist on outright lying about what Labour's Brexit position actually is. Despite continual misrepresentations by their political opponents, the Labour shadow cabinet position on Brexit is actually pretty clear and simple. Labour have devised a compromise position that respects the result of the referendum, but which insists that the final Brexit deal is subjected to Keir Starmer's six tests. This means that if the final Brexit deal the Tories negotiate with the EU is going to be a disaster for Britain (as the Tory government's own impact assessments indicate it will), the Labour Party will oppose it. Labour have already shown their determination to fight against a hard-right Tory interpretation of Brexit by seeking to add amendments to the EU Withdrawal Bill in order to prevent the Tory government from using Brexit as a Trojan Horse to attack our workers' rights, consumer protections, environmental laws, equality rules, and food standards. After the Tories ripped up these amendments Labour were left with no choice but to vote against the EU Withdrawal Bill (which is hardly colluding with the Tories as so many people like to claim they are). Unfortunately Labour and the other opposition parties didn't have the parliamentary numbers to stop the Tory EU Withdrawal Bill because a whole load of so-called "mutineer" Tory MPs like Anna Soubry who make a lot of noise about opposing hard Brexit decided to back Theresa May and the secretive cabal of ERG Brextremists who dictate her every move, and actually voted in favour of it. The reason Owen Smith was sacked from the Labour Shadow cabinet is obvious. He decided to break ranks with the agreed position that Labour needs to subject the final deal to Keir Starmer's six tests, and publicly set out his own bespoke Brexit policy. Any competent political leader can't have their ministers going off and making up their own policies on the hoof, because that's the path towards the kind of incompetence and directionless of Theresa May who has so little authority over her own party that she couldn't even sack Boris Johnson from her cabinet after he made up his own Brexit policy that totally contradicted her own! Love them or loathe them, strong leaders like Tony Blair and Margaret Thatcher would never have allowed their ministers to just make up their own policies on the hoof. That's why Corbyn was right to sack Owen Smith, just as he was right to force out the unmistakably Corbynite MP Chris Williamson a few months ago after Williamson decided to announce his own bespoke policy on Council Tax. Of Course Owen Smith has every right to criticise Labour's Brexit position from the back benches, but only a ridiculously weak and directionless leader like Theresa May would allow him to criticise the party position from within the party leadership. Perhaps the worst thing about Owen Smith's decision to announce his own Brexit policy from within the shadow cabinet is the appalling timing just as the 2018 local election campaign is gearing up. You'd have to be astoundingly gullible to imagine that Smith only just realised his opposition to the agreed Labour position right now, just when attacking his own party from within the cabinet would do the maximum damage to Labour's chances at the local elections. Agree with Smith's call for a second EU referendum or not, it's impossible to argue that the timing of his decision to cause chaos by breaking from the agreed party line is incredibly damaging to the chances of thousands of Labour local election candidates up and down the country. 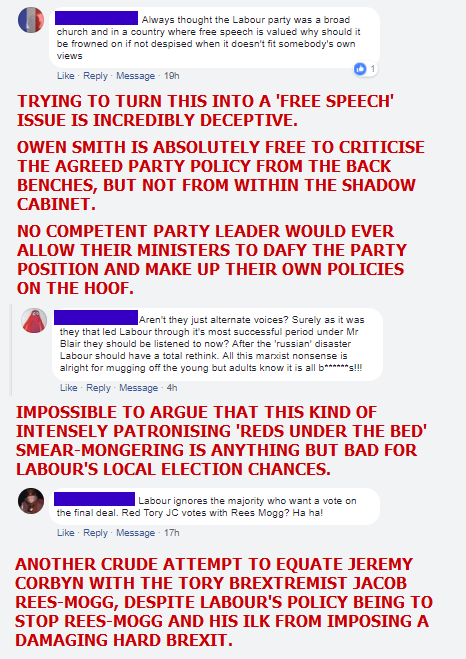 I wrote an article pointing out that the Labour right-wingers have form for this kind of internal wrecking behaviour, and that Smith's decision to publicly defy the agreed party line looks an awful lot like a deliberate effort to damage Labour's chances at the 2018 local elections in order to use the poor result as an excuse to have another crack at deposing Jeremy Corbyn as party leader. 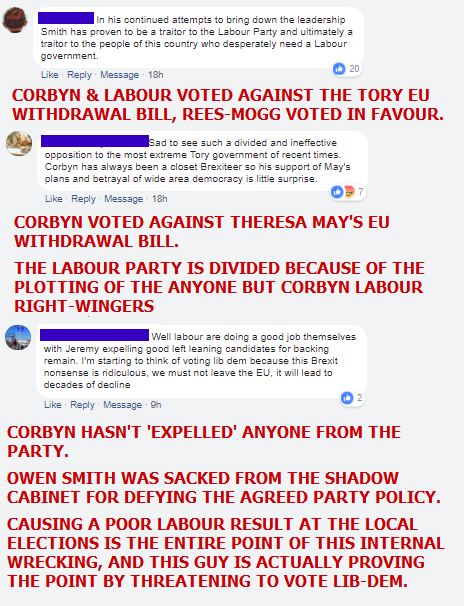 Aside from these examples of various different lies and misrepresentations of Labour's Brexit position, it's easy to find plenty more. 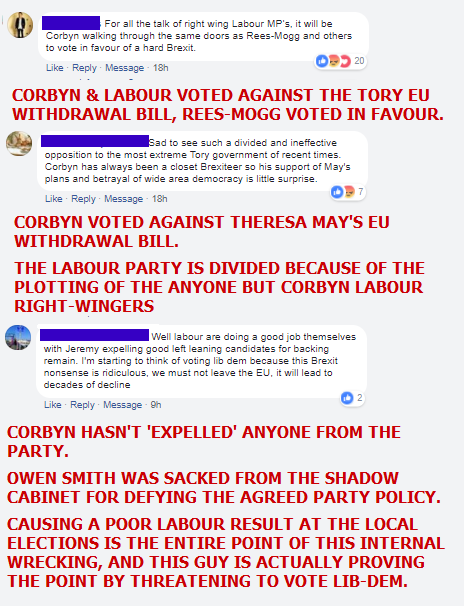 Just peruse through the #FBPE hashtag on Twitter and you'll find dozens upon dozens of people outright lying with claims that Labour support Tory hard Brexit. As I said before I've got no objection to people opposing Labour's position under Jeremy Corbyn's leadership, that's an essential part of democracy. What I object to is this bombardment of lies, smears, and brazen misrepresentations of what Labour's position actually is. So why do so many people insist on lying like this? They're either ignorant people who have heard the lies elsewhere, and uncritically regurgitate them as their own opinions, rather than actually checking the facts and rejecting them as lies. 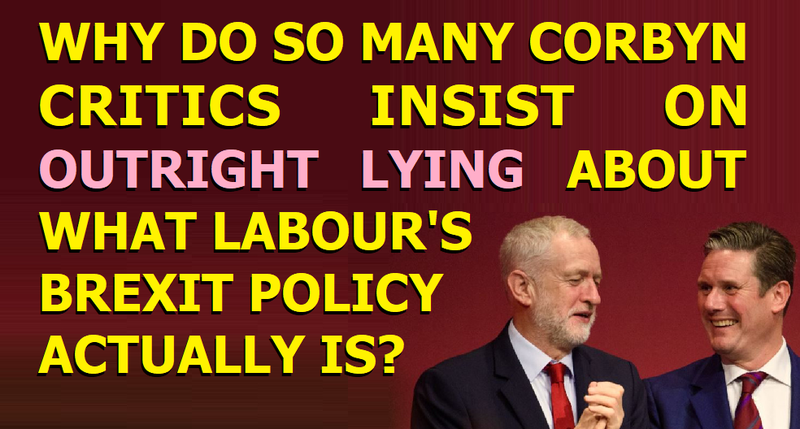 The other alternative is that they do actually understand Labour's Brexit position, but they also know that the Brexiters won with a campaign of absolute lies, so they're adopting the same staggeringly dishonest tactics because they think it's the most effective way of attacking Corbyn. It basically comes down to stupidity or mendacity. Are these people just ignorant rote learners who don't even understand Labour's actual Brexit policy, but insist on attacking it with lies? Or are they cynical propagandists who believe that lying about Labour's position will have more impact than any kind of fact-based critique? The thing is that whatever our political stance (pro-Corbyn, Corbyn-sceptic, Remainer ...) it's absolutely vital to demonstrate that we're actually better than the lying right-wing Brextremists. The Brextremists use deceptions, smears, false promises and lies to get what they want. That they rely on lies to achieve their objectives is absolutely undeniable after the Vote Leave director Dominic Cummings admitted that they would never have won without the "£350 million for the NHS" lie. We know this because the other even more right-wing and dishonest Leave.EU Brexit campaign worked with Cambridge Analytica to con people into voting for Brexit, and that Cambridge Analytica openly admitted that their strategy is that "it doesn't have to be true, people just have to believe it". Whether we support Labour's position of subjecting the Brexit deal to Keir Starmer's six tests or not, those of us who oppose the Tories and the hard-right Brexit liars must ensure that the foundations of our political positions are facts, evidence, cogent analysis, and honest presentation. Otherwise we come across as being just as dishonest as they are, which leaves all the decent honest people in society with nowhere to turn but political apathy.